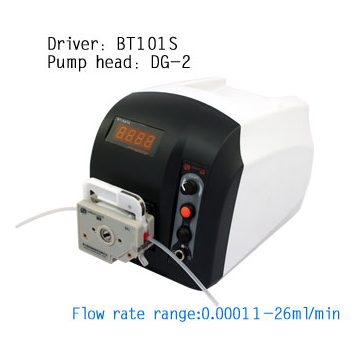 BT101S Basic Speed –Variable Peristaltic Pump flow range is 0.00011-720ml/min. Rotate speed is 0.1-150rpm.With basic functions such as reversible direction, start/stop, full speed (fast cleaning), adjust speed .Dispensing function can realize the repeat timing quantitative dispensing liquid .RS485 interface, as adopting the MODBUS communication protocol, the pump is easier to be connected with other equipments, such as computer ,human machine interface and PLC . • Speed resolution: 0.1-100 rpm, the speed resolution is 0.1 rpm. • External control：Input electrical level 5V, 12V (standard),24V(optional).